program. It helps students start building a future and gives them the initiative to work harder. Having motivation will help to excel in school expectations. While the majority of people will do only what is required, Gateway to College students are encouraged to go further. GTC staff constantly remind students of the importance of having an increased education and help them remain motivated. The process toward the completion of the program may seem difficult and prolonged at times, but being motivated and goal-oriented will have only positive outcomes. While difficult challenges will always be present, motivation will help you overcome them successfully. Selena Quiroz is an excellent example of a successful student when it comes to motivation. She has been of part of the Gateway to College program since the inception of the Gateway to College program fall semester of 2013. Quiroz has managed to overcome any setbacks in her journey towards graduation. Quiroz believes that if a student is motivated and goal oriented he/she can reach graduation. Many students fail to graduate from GTC program because of the lack of motivation. That is why motivation is vital when it comes to academic success. seek assistance in any areas of struggle. purpose is to build school morale and encourage students to become involved with a variety of fun and healthy outlets. It helps students because it builds pride for the school and makes school more enjoyable. All students are also invited to Power Hour, a time for ideas, information and inspiration. The duration of each student’s participation in the program is scheduled to fit and meet the different requirements of each student. Every student begins his or her journey into Gateway with a Foundation semester, which consists of basic courses. The goal of this Foundation semester is to prepare students for their transition into college classes both academically and mentally. Convocation Mass is unique to Donnelly and happens every fall semester. During this mass Donnelly’s staff and students journey to St. Peter’s Cathedral. This walk symbolizes the journey we are embarking on for the rest of our lives. The professors in lead symbolize that they are there to help guide us and nurture us on our academic journey. Since being at Donnelly, I have attended two convocations. This fall there was something important added into the Mass. The matriculation ceremony began by students repeating a pledge to the school, community and themselves. Afterwards, the instructors stood up to repeat their part of the pledge, saying they will do anything in their power to see us succeed. After the Mass, we lined up and made our procession back to school for lunch and music, enjoying the company of our Donnelly family. Donnelly College currently has an intramural sports program, and Gateway students have the opportunity to participate. This opportunity demonstrates the equality set and gives everyone a chance to become involved. The only requirement for Gateway students to participate is to maintain passing grades of at least a C in all their classes. Gateway believes that responsibility is important. Therefore, if students demonstrate their dedication and efforts, they will be rewarded with the opportunity to participate in the intramural sports the College has to offer. I had the pleasure to speak to Alex Taylor, a Gateway student from the foundation fall semester. Taylor said his involvement in the sports program motivates him to continue to succeed and continue his path through Gateway. He currently participates in basketball and has straight As. He is committed to graduate from Gateway and will continue to work hard in order to continue being a part of the basketball team — which is why he is considered a great example of someone who balances sports and education. Taylor looks forward to maintaining good grades and, in the future, fulfilling his education through potential scholarships with the help of sports. Gateway offers all the resources needed to obtain good grades. He said he believes students need to take advantage of all this help. their own values, as well as what are called the core values of Donnelly. Those values are: inclusivity, justice, excellence, service, truth, diversity and community. In a recent interview with the President of Donnelly, Monsignor Stuart W. Swetland, he discussed these values. Monsignor Swetland had a great deal to say about Donnelly’s core values, and the first thing he wanted to say was the order in which he liked to talk about them. When asked how these values tied into Donnelly College’s purpose, and its Catholic origins, Monsignor Swetland had more to say. “When it comes to truth, if you look at John 14:6, Jesus says, ‘I am the way, the truth and the life. No one comes to the Father except through me,’” Monsignor Swetland said. “As a Catholic institution, we are very committed to the pursuit of not only religious truth — the truth that Jesus taught us — but also through what theologians or philosophers would say: reason alone. We understand truth as two wings of a dove, being held up by faith and reason, and they complement each other. We of the Donnelly College Gateway Newsletter would like thank President Monsignor Stuart W. Swetland for his time, and for his wonderful insight into the Core Values of Donnelly. It is our hope that his words will inspire students and staff alike to be the very best that they can be. The term often used for students of color and those living in poverty-prone areas is “at risk” — but in reality, we are just under-served. We have the potential and ability to do anything, and we are equal to our counterparts. Our limitations are already set because of where we came from. Just because the community is known for poverty and low educational expectations doesn’t mean that’s all we are. Kansas City, Kansas is a diverse community with people from all walks of life. Additionally, the majority of students in the Kansas City, Kansas Public School system are students of color. 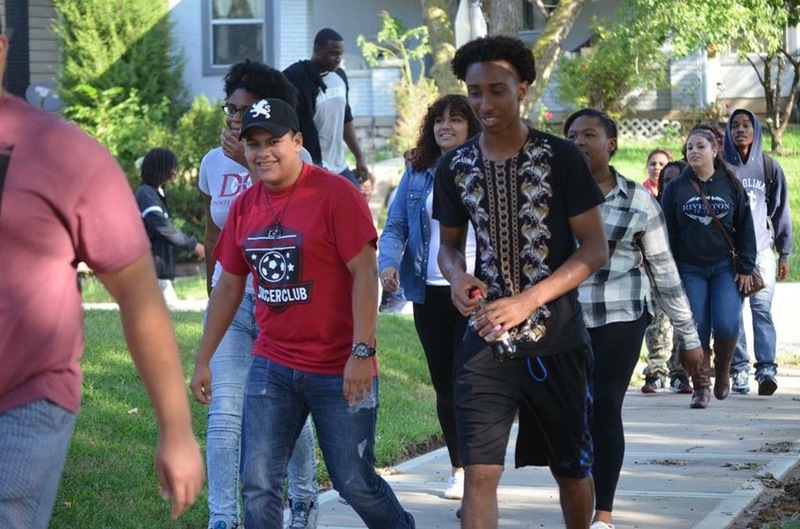 Eighty-eight percent of approximately 25,000 students are African-American, Latino and Asian. Furthermore, ninety-one percent are classified as economically disadvantaged. You can see where I’m coming from when I say “at risk” has become a label on the students here. It’s true that most people are products of their environment, but our environment can also motivate us to do better. We are not what others think of us; we can rise above expectations. My peers and I are tired. We deserve the right not to be seen as “at risk,” but as students in whom you can believe. It seems as if our fate was sealed the moment the label “at risk” was stamped on our transcripts. We are escaping our fate and would like everyone to notice. As a student from Wyandotte County in Kansas City, Kansas, my hope, as well as my peers’, is to return one day to our communities and contribute. Is this topic important to you? Join the conversation by commenting below. Future Laundry is an activity where the students of Gateway’s fall semester drew representation of their ideal futures on paper T-shirts. When Ms. Hodges assigned the activity, her goal was to have the students think about what they truly want and how they plan to get there. By encouraging students to think of the greater picture it allows them to stay motivated during this school year. Each shirt is unique to the student and gives the viewer a glimpse of that student’s hobbies and passions. Katalena Brening , Brittany Philips, Sergio Murillo, Melanie Quinones , Juan Rangel and Andrea Kagay. 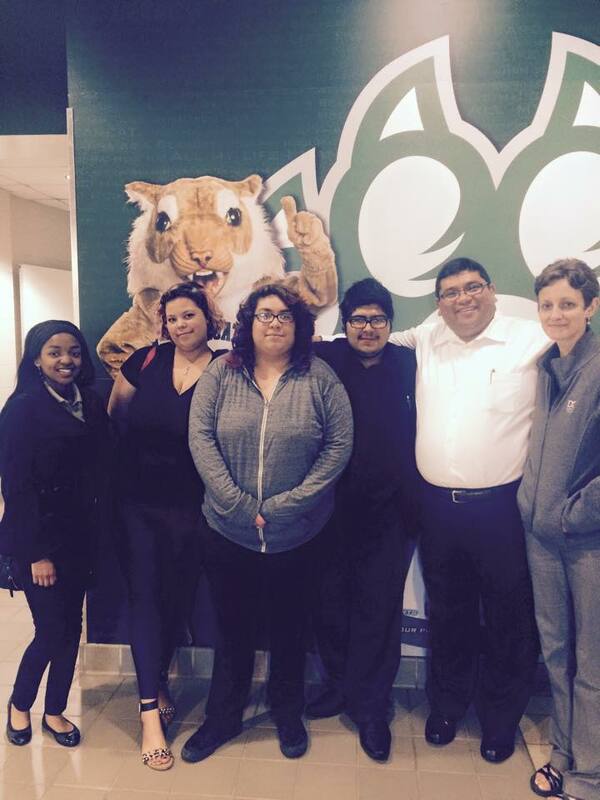 This spring, a group of Gateway students were invited to Northwest Missouri State University to talk about the Gateway program and how it has affected them. The student teachers in the university’s program wanted to know what led Gateway students to leave their original high schools and what they could do to prevent their future students from going down the same path. When the group first arrived, they were given a tour of the school and student life on campus. The students were shown dorm life and all the school has to offer, academically and living wise. Afterword they treated to a lunch with faculty and heard about the program from professors. Gateway students took this time to make connections and practice what they were going to say at the meeting. After lunch, Gateway students were introduced to a multicultural group from Northwest Missouri State. They gave students an insight of what it is really like to attend a university as well as answer questions. The students together shared ideas, experiences and perspectives of diversity. This was important because Northwest Missouri State is primarily a white school with a13% ethnicity. Gateway at Donnelly College has not had much exposure to being an actual minority. Schools in Wyandotte County are primarily Hispanic and African-American, with only a 12.60% of white students. The Ploghoft Diversity Lecture series features speakers and events that broaden the educational perspectives. This allows the future teachers to learn about the issues facing the education of students from diverse environments was the reason behind the invitation. During this lecture, Gateway Director Juan Rangel talked about how he came to attend the university, as well as the creation of Gateway to College. The students spoke about what caused them to drop out as well as what could have prevented that. 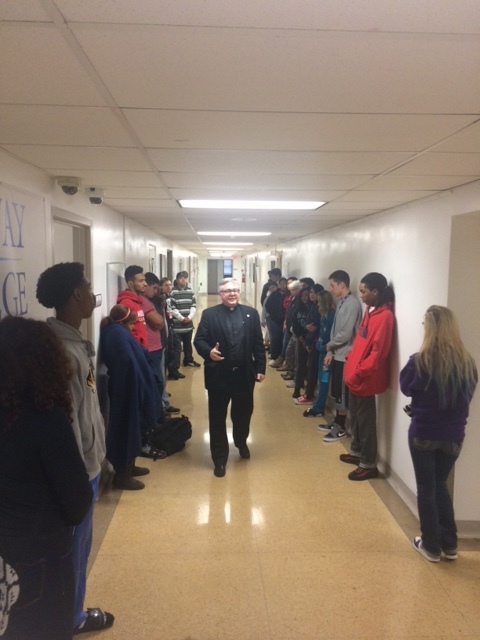 One of the ways new is spread amongst the Gateway to College community is through hall meetings. Juan Rangel, the director of Gateway, is the lead speaker when it comes to informing students of upcoming events. Hall meetings are used for applauding students on their achievements and to remind them when they are falling short. It is a time for the program to come together as a whole and to be reminded of the bigger picture: graduation. Gateway students walking to convocation. Convocation mass is unique to Donnelly and happens every fall semester. During this mass Donnelly’s staff and students journey to St. Peter’s Cathedral. This walk symbolizes the journey we are embarking on for the rest of our lives. The professors in lead symbolize that they are there to help guide us and nurture us on our academic journey. Since being at Donnelly I have attended two convocations. This fall there was something important added into the mass. The matriculation ceremony began by students repeating a pledge to the school, community, and themselves. Afterwards the instructors stood up to repeat their part of the pledge saying they will do anything in their power to see us succeed. After the mass we lined up and made our procession back to school for a lunch and music, enjoying the company of our Donnelly family.